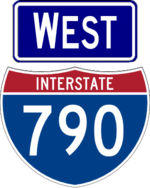 I-790 is a short freeway in the Utica area. It is multiplexed with NY 5 for its entire length and with NY 8 and NY 12 for much of its length. The portion parallel to the Thruway used to be an independent super-2 (with NY 5 on the northern side and I-790 on the sourthern side) until the interchange with NY 8 and NY 12 was reconfigured to its present configuration. 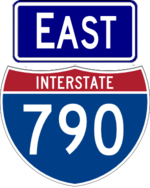 I-790 is one day planned to take the route of NY 49 to Rome (after an at-grade railroad crossing is removed).